TIRUMALA, NOV 26:The calendars and diaries published by TTD has a remarkable place not only in our country but across the globe said, the Hon’ble Governor of the State of AP H.E.Sri ESL Narasimhan. The Governor released 12-sheet Calendar and Diary of 2015 published by TTD in front of the Srivari temple after the darshan of Lord Venkateswara in Tirumala on Wednesday evening. Addressing media persons on this occasion he said, the people in the country keep the TTD calendar or diary in their households and feel that as if they are present at the abode of Lord Venkateswara. “Such is the demand for TTD calendars and diaries. I was informed that TTD has printed over 20 lakhs calendars and 6 lakhs diaries for 2015 for the sake of the pilgrims”, he maintained. Earlier he was accorded warm welcome with temple honours (Isthikaphal) at his entrance at Mahadwaram. After darshan of Lord, the Veda pundits offered Vedasirvachanam at Ranganayakula Mandapam. TTD EO Sri MG Gopal, Tirumala JEO Sri KS Sreenivasa Raju offered prasadams and lamination photo of Lord to the Governor. Later the Governor took part in the Sahasra Deepalankara Seva also. Before having darshan of Lord Venkateswara, the Governor paved visit to Tiruchanoor and had darshan of Goddess Padmavathi Devi. The Governor will also take part in the Panchami Teertham on Thursday at Tiruchanoor. 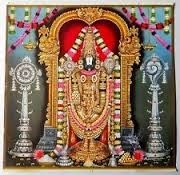 Meanwhile the TTD has printed 12 lakh copies of 12-sheet calendar which bears exquisite photos of Sri Malayappa Swamy along with Sridevi and Bhudevi in different floral decorations and attires, Sri Kodandarama Swamy, Sri Vedanarayana Swamy of Nagalapuram, Sri Govindaraja Swamy, Sri Pundarikavalli, Sri Kapileswara Swamy and other photos with a background embossed pictures of Dasavataram concept. Apart from these calendars TTD has also published 8 lakh copies of other calendars includes Lord, Goddess, Panchangam etc. All these calendars are available in Tirumala counters on Wednesday (from November 26) while the diaries will come into availability from second week of December. The pilgrims are requested to make note that the TTD calendars and diaries will come into availability in counters and TTD kalyana mandapams across the state and in the country from second week of December on wards.